As part of its recent conference, Nintendo's released screen shots of six upcoming DS titles including a new Kirby adventure, a Pokémon typing-based game and the next entry in the Mario vs. Donkey Kong series, Mini-Land Mayhem. There are some friendly dogs and fearsome dinos to see as well, not to mention some new screens from Golden Sun: Dark Dawn, so head over and check them out! You can also see footage of these and more, including Okamiden, Nine Hours, Nine Persons, Nine Doors, Kingdom Hearts Re:coded and Crafting Mama as part of a gameplay video reel in high or low definition. A... Pokemon Typing game? I knew about the Mario vs. Dk thing already from NP I think. A new Mario vs. Donkey Kong game has been annonced for a while. Lol, Kirby 128, anyone? It's not really a typing game, it's an educational game that helps kids translate Japanese kanji into standard letters. Yeah, I don't see a typing game working on a DS at all. The screen is far too small and there's no references for your fingers. I'm leaning towards XD375's explaination. Thanks for the comments. We've edited the article to reflect that the Pokémon game is based in typing but is not necessarily in the "typing game" genre, and that the Mario vs. Donkey Kong game is not the news, just the new screenshots. @SmaMan: As bad as the game is, I really wish I had Mario to teach me typing, and not this Kewala thing we had at my school. Aw, and for a moment there i Thought it was The Typing of the Pokemon. Why a new Kirby DS game? I mean, that's cool and all but we already have 3 kirby games for the system! Why not just make it for the 3DS, especially when it's so close to release? Well why another Pokemon game on the DS for that matter, there's at least 15 of them! exactly, I was thinking the same thing. It's like Kirby is gonna be like that at this rate. one would have thought that having 4 different kirbies at the same time was crazy enough. Now we have 10. Kirby one's all I care about. 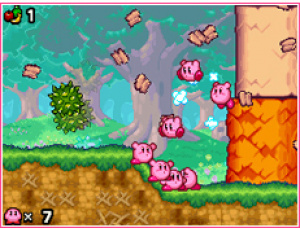 That Kirby game looks pretty cool. Oh no... a Pokemon themed typing game. I hope that the next Kirby game doesn't have that crappy music that has plagued the recent portables. If it does, I'm complaining! I used to be a Kirby freak back in the day. Today, not so much. I'd love to get re-hooked. The new kirby game looks good, so does mario vs. donkey kong: miniland mayhem, 9 hours, 9 persons, 9 doors and radiant historia. New Kirby game is always great news. Yeah there are only two. And even if there were three, why should that stop them from making another? The Kirby game looks sweet, but Pokémon typing weirds me out. Wow a new Kirby game already. Man, that Kirby game looks awesome. I wonder what it'll be called?